Channel 3 KATC news report on new operations center. in the Atchafalaya River Bar Channel. As of Monday, mariners now have access to more real-time weather and waterway information in the Atchafalaya River to assist them in their navigation efforts and decision making. Two Physical Oceanographic Real-Time System stations, which were recently installed near the Eugene Island Lighthouse and about two miles south of Eugene Island in the Atchafalaya River Bar Channel, became operational Monday, according to officials. The Morgan City Harbor and Terminal District Commission met Monday at the Port of Morgan City. The stations were paid for by $550,000 in 2011 port security grant funding. Eugene Island Lighthouse is about 25 miles south of the Port of Morgan City. The system consists of four stations including the two newly-installed and two more stations in Berwick and Amerada Pass, Darren Wright, PORTS program manager for the National Oceanic and Atmospheric Administration said. The two older stations have been in place for six years and two years,respectively. Amerada Pass is located four to five miles north of Eugene Island. “Now we’ve got coverage all the way for our entire channel,” Port of Morgan City Executive Director Raymond “Mac” Wade said. The systems are a network of oceanographic and geological sensors located near ports to provide mariners with information to help them navigate safely and efficiently, Wright said. The information the systems provide includes observed and predicted water levels, river current, wind speed and direction, barometric pressure, and air and water temperature, Wright said. NOAA partnered with the Port of Morgan City, which acted as the project sponsor, to install the systems. NOAA provides the program management, data collection, infrastructure dissemination and the quality control on a 24/7 basis, Wright said. The Port of Morgan City’s real-time system is the 24th such system implemented around the country, Wright said. NOAA officials studied the impact of the systems’ economic benefits, which showed a 59 percent reduction in vessel groundings and 21 percent reduction in oil spills just by knowing the up-to-date info, Wright said. Data from the real-time systems can be accessed by visiting tidesandcurrents.noaa.gov/port s/index.html? ort=mc. The mobile link is mobile.tidesandcurrents. noaa.gov/ports/mobile.sht ml?port=mc. People can also call 888-312-4113 to access the data. Two major Louisiana shipping hubs will see improvements this week, according to the National Oceanic and Atmospheric Administration. New sensor systems will make navigation safer and allow for more efficient ship traffic at the Port of Morgan City and the Port of Fourchon. 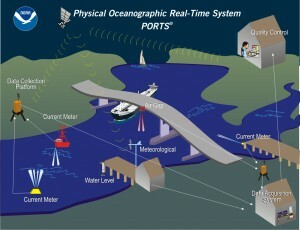 The Physical Oceanographic Real Time System, or PORTS, was created by NOAA and uses oceanographic and meteorological sensors to provide mariners with accurate real-time information on the environment at seaports. NOAA is working with individual ports to design the systems. Morgan City is a hub for import-export ships. According to NOAA, Port Fourchon services 90 percent of the deepwater Gulf of Mexico oil and gas industry and handles more than 20 percent of the enation’s energy supply. They are the 24th and 25th ports in the nation to receive the technology. Port of Morgan City executive director Raymond Wade praised NOAA and the new technology, saying it would improve overall safety. Wade expects the ship to leave the port tonight. U.S. Rep. Charles Boustany, R-Lafayette, helped host a 2015 Hurricane Preparedness Public Meeting Tuesday at the Morgan City Municipal Auditorium. Meeting at the Morgan City Municipal Auditorium. U.S. Rep. Charles Boustany, RLafayette, partnered with the National Weather Service, National Atmospheric and Oceanic Administration, and Port of Morgan City to host the meeting. “Our maritime sector and our coastal life is vital for all of us,” Boustany said. “It’s part of our culture. It’s ingrained in us, and our safety has to be first and foremost.” Tuesday’s forum also served as a time for officials to reflect on the upcoming 10-year anniversary of Hurricanes Katrina and Rita. Since that time, hurricane forecasting and tracking, and impact and intensity assessments have greatly improved, Patrick said. People should keep in mind that hurricanes, such as Hurricane Audrey in 1957, Hurricane Betsy in 1965, and Hurricane Andrew in 1992 occurred in El Niño climates, he said. El Niño normally suppresses tropical storm development in the Atlantic Ocean but brings a more abundant hurricane season to the Pacific Ocean, he said. into two barges at the port, where it will stay until a ship arrives to take it to Haiti. to a barge. Any rice that falls off the conveyer belt is disposed of, Wade said.